The initial outbreak of the H1N1 swine virus is said to have occurred in Mexico. The emphasis, at the political level, has been on tracking the spread of the Mexican swine flu virus as well controlling and monitoring the movement of people in and out of Mexico. A global campaign of fear and insecurity was unleashed following the WHO April 28 announcement of a phase 5 pandemic. The decision of the WHO, which was taken after consultations with Washington and Brussels, was based on unconfirmed and incomplete data regarding the spread of the swine flu and the numbers of cases. What proves that Mexico was the epicentre of the WHO’s global swine flu pandemic? 1. The official data pertaining to morbidity and mortality were, in numerous cases, both in Mexico, the US and around the World, not firmly corroborated by laboratory testing of the H1N1 virus. A large number of so-called recorded cases were the result of data manipulation. The Mexican data used by the WHO to justify the phase 5 pandemic, largely pertained to cases of non-specific rather than laboratory confirmed H1N1 influenza. Out of the 159 deaths reported prior to the WHO’s decision on April 28th, only 7, according to official sources, had been corroborated by laboratory tests of H1N1 infection. The question is: can we trust the official figures and statements. 2. Numerous cases of alleged H1N1 infection in North America, the Europe Union and other countries have been reported, which bear no causal relationship to the Mexican outbreak, namely they cannot be traced back to Mexico. Are the cases of H1N1, reported in different countries, the consequence of a process of international transmission of the swine flu virus, or are they the result of a pre-existing situation? Or are they the consequence of a process of incorrect and misleading recording of the data. In other words, were these various “recorded cases” corroborated by lab testing of the H1N1 virus? 3. According to a recent report (Bloomberg, May 12, 2009) which was barely publicised, a prominent scientist directly involved in the development of Tamiflu points to the possibility that the H1N1 strain “resulted from lab experimentation or vaccine production”. According to professor Adrian Gibbs of the Australian National University (ANU), the virus which “escaped from a lab”, was the direct product of a laboratory experiment by the company which produces Tamiflu. There have been several previous unconfirmed reports on the issue. Professor John Oxford of St. Bart’s and the Royal London Hospital contends that “the 1957 H1N1 pandemic probably started when it escaped from a lab” (National Public Radio, May 4, 2009). While the findings of Professor Gibbs require further investigation, they, nonetheless, raise the broader issue of transmission out of a laboratory, not to mention the underlying geographic location of a laboratory. The WHO is investigating the findings of Professor Gibbs. 4. The issue of pig to human transmission of the virus has been carefully overlooked. Can pigs infect humans with swine flu? This question is fundamental in assessing the origins as well as the causes of the pandemic. Are industrial hog farms a source of infection? Ironically, while denying pig to human transmission of the swine flu, health authorities do not deny the transmission of the H1N1 from humans to pigs (see our analysis below). The focus of the WHO and the Atlanta based CDCP has been on human to human transmission of the swine flu virus, from one country to another, while carefully avoiding the broader issue of pig to human transmission. The WHO has argued that in the case of the H1N1 swine flu strain (a hybrid combination of human, pig and avian flu), there is no possible transmission from pigs to humans. This assessment implies that the health and environmental conditions on the hog farms have nothing to do with the spread of the virus. While one of the first cases of the H1N1 influenza was recorded in the municipality of Perote, State of Veracruz, which houses an extensive hog farm industry, Mexican public health officials are categorical: the environmental and health conditions in the hog farms are not the cause of the transmission. The City of La Gloria, Perote, is a company town, which is described in some Mexican reports as the pandemic’s “ground zero”. The employer is Granjas Carroll, a joint venture between the World’s largest hog producing company Smithfield and its Mexican partner Agroindustrias Unidas de Mexico (AUM). The Smithfield project in Perote Municipality includes 16 farms and an annual output of more than one million pigs. According to official Mexican data, there is no tangible evidence of swine flu within the Perote hog farms, namely the pigs were not infected. 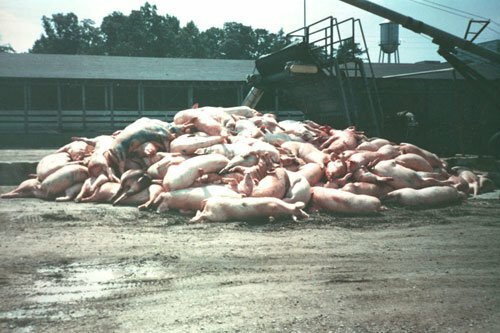 A number of other ailments could, however, have been triggered among the population as a result of the health and environmental conditions in the factory farms. The broader question is whether we can actually trust the data. A recent authoritative study by the John Hopkins School of Public Health on Industrial Farm Animal Production (IFAP) refutes the statements of the WHO. It confirms that IFAP hog farms are not only the source of contamination of surrounding groundwater but also of the spread of novel viruses including swine flu (See Pew Commission on Industrial Farm Animal Production, Pew Foundation and Bloomberg and John Hopkins School of Public Health, Putting Meat on the Table Industrial Farm Animal Production in Americas, see also Washington Post, May 9 2009). While the data regarding Granjas Carroll in Perote Municipality, remains inconclusive, there is evidence, confirmed by official reports, that at least one hog farm outside Mexico was infected by the H1N1 virus. In early May, health authorities in Canada reported on a rather unusual case whereby an entire hog farm in the province of Alberta became infected with the H1N1 swine flu. 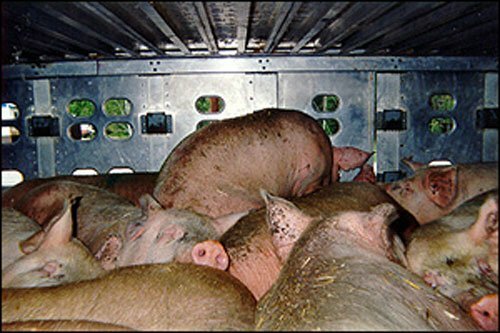 A Mexican carpenter, returning from Mexico to a hog farm in central Alberta where he was employed, allegedly infected 220 hogs out of a total of 2200. “The farm worker returned to Canada from Mexico on April 12 and had contact with the pigs two days later. About 220 pigs in the herd of 2,200 began showing signs of the flu on April 24, said the country’s top veterinary officer, Dr. Brian Evans of the Canadian Food Inspection Agency. One other farm worker subsequently fell ill. It’s not yet known if that person caught the swine flu. Bulletins were sent to Alberta pork producers warning them of the possible danger that swine flu could present to their herds on April 24, said Gerald Hauer, the province’s chief provincial veterinarian. But by that time, the farm worker was already back from Mexico and on the job at the 2,200-hog operation. “He was in the barn, doing his work on April 14,” Hauer said. The Alberta hog farm, which is part of an evolving saga, is central to an understanding of the origins of the pandemic, namely that pigs on IAFP farms in North America could potentially be the source of pig to human infection. The official version is that the hogs were infected by a Mexican worker. According to the first press reports, the owner of the hog farm and his family as well as the pigs were infected by the Mexican worker. These official reports pointed unequivocally to Mexico as the source of the infection on the alberta hog farm. It was subsequently confirmed after laboratory confirmation that the owner and family members tested negative to the H1N1 virus. “Canada’s chief public health officer says the people who live on an Alberta pig farm where pigs were found to be infected with swine flu have tested negative for the virus. A number of people living on the unidentified pig farm experienced flu-like symptoms after the pigs fell ill and were tested to see if they too were infected. The official version is that the Mexican worker infected the pigs but not the people on the farm. Following the release of the lab reports confirming that the Mexican carpenter tested negative to the H1N1 virus, one might have expected that the Canadian authorities would have broadened their assumptions. If the Mexican worker tests negative, what are the likely causes of the H1N1 infection on the Alberta hog farm? Despite the visible lack of reliable evidence, the Mexican farm worker is still considered to be the source of the infection. One might reasonably ask: was the culling intended to get rid of the evidence of infection on the hog farm? Stage Six: Culling the Infected Pigs. Covering Up the Evidence? The pigs are infected. But all the humans on the hog farm, including the Mexican carpenter, test negative. No report has been released regarding the results of the antibody test.Culling is defined as killing animals “with undesirable characteristics”, namely getting rid of the infected hogs. “This doesn’t have anything to do with the flu,” Hauer told a news conference. “It has to do … with animal welfare.” The decision to cull the herd [500 heads] was to ease overcrowding, Dr. Gerald Hauer said Saturday. Did the pandemic originate in Mexico. The evidence is contradictory. Many of the reported cases in Canada, the US, and around the World, cannot be traced back to the epicenter of the virus in Mexico. These cases were discovered and reported following the Mexican outbreak. The question is whether they were “discovered” as a result of a process of laboratory examination or were recorded without adequate testing. Are these figures reliable. Are they the product of data manipulation with a view to creating an atmosphere of fear and panic. is the H1N1 swine virus prevalent in industrial hog farms? Visibly there was an outbreak of swine influenza in a central Alberta hog farm, confirmed by the Canadian health authorities. The pigs tested positive to the H1N1 virus, according to the official report. People on the farm tested negative. Canadian officials have failed to address the exact causes of the swine flu on the Albertan hog farm. It is worth noting that there was intense lobbying by the pork industry to change the name of the virus, from swine flu to A H1N1 influenza. If the Mexican carpenter is not the source of the infection, this suggests that the H1N1 swine flu was already prevalent in the Alberta hog farm and had noting to do with the outbreak in Mexico. This in turn raises the broader issue of H1N1 swine flu infection in similar Canadian and US hog farms as well as the issue of pig-human transmission of the virus. What happened on the Alberta hog farm, therefore, could potentially upset North America’s industrial hog production.